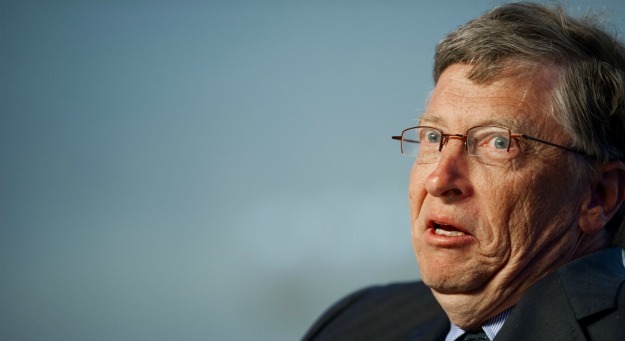 Good Night and Good Luck: Is Being a Public School Teacher REALLY Un-American, Mr. Gates? 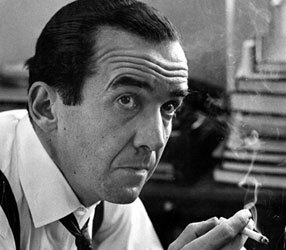 “Good Night and Good Luck”, as a movie, is a study of Edward R. Murrow’s role as a main stream media journalist who confronted a witch hunt brought on by Senator Joe McCarthy, otherwise known as the mass hysteria of McCarthyism. 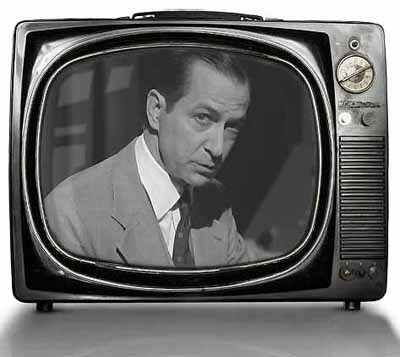 Edward R. Murrow becomes the protagonist in this story, exposing McCarthyism for the propaganda it spread across America. My last post “The Cruicible – NYC and the Department of Education’s Mass Hysteria” introduced the topic of the nation’s latest attack on America’s public school teachers. 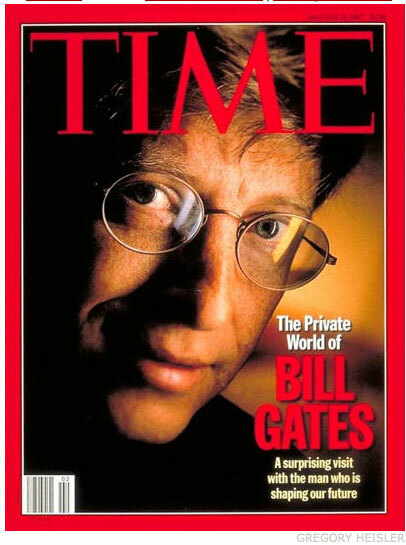 Bill Gates tries his best to cover his tracks, but his MET Project and his partnership with Rupert Murdoch in their Shared Learning Collaborative, LLC – their data system that was designed exactly for this Teacher Witch Hunt – speak the real truth of his involvement. The mass hysteria created by Bill Gates and Rupert Murdoch surrounds public education in a similar way, but there’s something far different today. Today’s main stream media journalists are bought and paid for by the oligarchy – they don’t have the courage or integrity to stop this witch-hunting mass hysteria. “Fareed Zakaria is worried about the state of American education. To hear the CNN host and commentator tell it, the nation’s schools are broken and must be “fixed” to “restore the American dream.” In fact, that was the title of Zakaria’s primetime special in January, “Restoring the American Dream: Fixing Education.” Zakaria spent an hour thumbing through a catalog of perceived educational woes: high dropout rates, mediocre scores by American students on international tests, inadequate time spent in classrooms, unmotivated teachers and their obstructionist labor unions. “Part of the reason we’re in this crisis is that we have slacked off and allowed our education system to get rigid and sclerotic,” he declared. Farhi continues, telling us how Zakaria as a main stream media journalist, adds to the mass hysteria of blaming teachers and their unions for problems that don’t really exist. [my emphasis added]…. The 50’s appeared to all who lived through the newly introduced media called Television, to be a simple time. “Leave It To Beaver” and “Father Knows Best” showed us a world with very few problems, a simpler, innocent time. But underneath that innocence, a Witch Hunt, the Un-American Activities Committee, McCarthyism, and a mass hysteria to justify it, had been brewing, starting back in 1938. People were looking for an answer to the Great Depression. Then too, unions were demonized as the root of the problem. Union members were labeled as “Red”. Union activities as a “Red Plot”. Belonging to a union became known as “subversive” and “anti-American”. All over the country…the friendly witnesses provide the names…the committee gives them to the press and the newspaper headlines tell the public…. 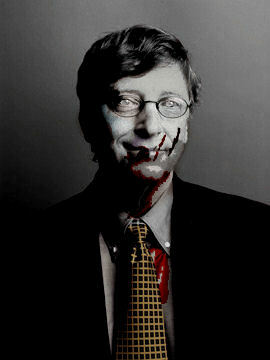 Is America prepared for the devastation that will be the result of Bill Gates’ and Rupert Murdoch’s Teacher Witch Hunts? See here on NYC Pix Channel 11. See here on NYC Wall Street Journal blog — scroll to bottom to see video. See here on MyFox NY 5. In Los Angeles last year, this public shaming proved to be too much to bear for 39 year old teacher, Rigoberto Ruelas, Jr who took his life after his low ranking scores, based on a flawed algorithm, were published for all to see. Watch this video and read the story, as reported by 7 Live in LA. “39-year-old Rigoberto Ruelas Jr. taught fifth-graders at Miramonte Elementary School. His body was found Sunday at the foot of a bridge in a remote forest area. An investigation is underway, but authorities believed he made a fatal leap on his own accord. Now we have teachers being tried, judged, sentenced, and executed in the court of the Fourth Estate. RT @DianeRavitch http://blogs.edweek.org/edweek/Bridging-Differences/2012/03/why_are_teachers_so_upset.html AMEN! Nothing UnAmerican about Due Process !! Ravitch tells it like it is ! Thank You from teachers ! 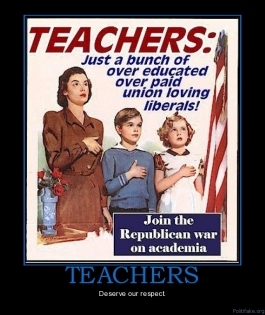 Are there other contemporary examples of branding unions and teachers as “un-American”? What have been some of the other attacks on unions? Has Bill Gates been involved in any of these attacks? 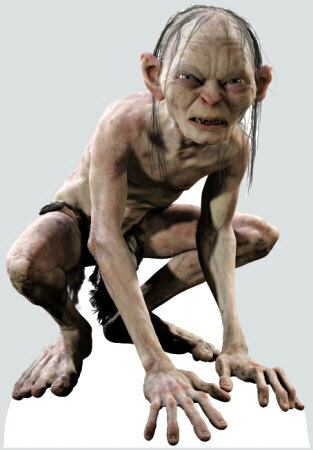 On 2-11-11, Governor Scott Walker threatened to call out the National Guard to bust unions in Wisconsin. “Wisconsin Gov. Scott Walker (R) said Friday that he was willing to mobilize the state’s National Guard force in order to address the potential repercussions of his stated proposal to eliminate collective bargaining rights for state employees…. And in Michigan, Governor Rick Snyder and the legislature tried to take an ax to collective bargaining too. “While the nation has been focused on the contretemps in Wisconsin, the Badger State’s neighboring Wolverines have taken a more novel approach in the effort to defang its public employee unions. A bill that is expected to pass the Michigan Senate today will give the state’s treasurer the ability to appoint emergency financial managers with broad powers to take over the operation of cities and school boards facing a financial crisis. 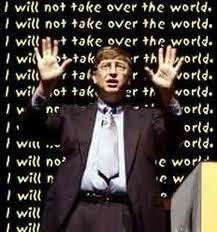 Bill Gates addressed the The National Alliance for Public Charter Schools in June 2010. On ABC in March 2011, Gates compared teachers to Enron in this ABC piece, “Bill Gates Criticized Long Held Norms in America’s Education System” here. Has the press done its job in reporting the truth? Or has it just become the creature of Bill Gates, Rupert Murdoch, Mayor Bloomberg, Arne Duncan, and the other Corporate EdDeFormers? for teachers to win a free iPad. 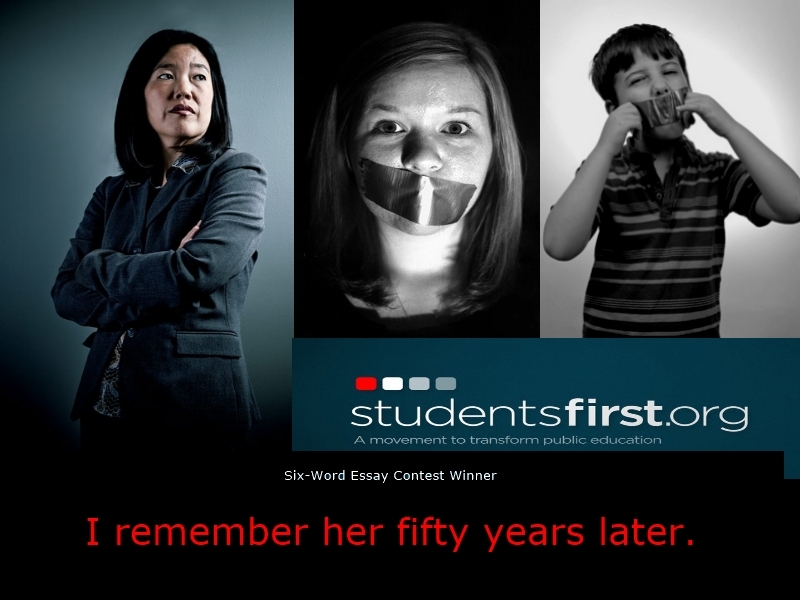 I’ll bet the students whose mouths were taped shut certainly will…remember Rhee 50 years later! 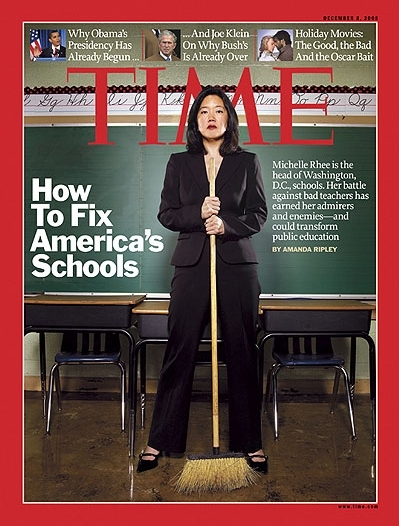 Score one for the truth tellers of journalism, as The New York Times did actually report on a small fraction of the truth about Michelle Rhee. Rhee was a Teach for America teacher and later became Chancellor of DC schools. Rhee is currently under federal investigation for her role in the DC cheating scandal. But why doesn’t the mainstream media cover the WHOLE truth about Rhee, who admittedly taped her students mouths shut to keep them quiet? Why would DC hire her as Chancellor knowing she taped students mouths shut to keep them quiet? Who was involved in getting her hired? Why did it take so long for Rhee’s “conspiracy of silence” in DC to break? Why would Arne Duncan share the stage with someone he is investigating? How does Rhee survive all this scandal? Why are her opinions still accepted as “expert” and used in mainstream media education ‘reform’ programming? 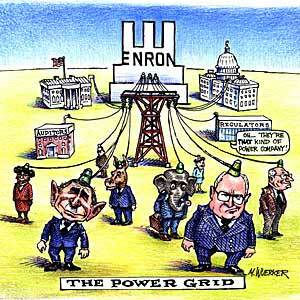 Just how deeply are these Corporate EdDeFormers involved in the mainstream media? Are the nations’ teachers doomed to be the victims of this 21st Century version of McCarthyism? Brokaw also put his gravitas behind Gates and other billionaire education reformers in a syndicated column that appeared in newspapers during the NBC summit in 2011, writing that “Entrepreneurs and captains of industry such as Bill Gates and Warren Buffett, home building tycoon Eli Broad, hedge fund billionaires in New York’s Robin Hood Foundation, have put education reform and excellence at the top of their personal and financial agenda.” Brokaw didn’t mention the objections to these “reforms” from teachers, nor ask why billionaires should be accorded expert status on education policy in the first place. NBC News does more than just report on the “reform” movement; it’s also in business with those who are promoting it. Among the corporate sponsors of its “Education Nation” summits are the for-profit education company University of Phoenix, the book publisher Scholastic Inc. and…the Bill & Melinda Gates Foundation. Remember that Aspen Institute study showing broad public awareness of NBC’s “Education Nation” efforts? It was funded by the Gates Foundation. In the 50’s Edward R. Murrow and his crew took a risk. Although Murrow was on CBS’s payroll, he did not have CBS’s blessings when he exposed McCarthy. Here is a synopsis of how Murrow and “Murrow’s Boys” took down Senator Joe McCarthy, despite the disapproval of his network, CBS. 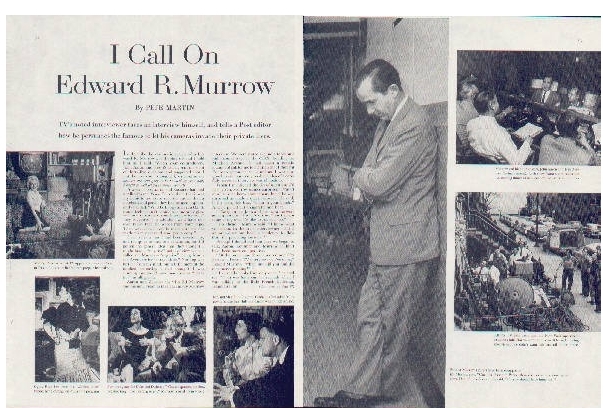 “Murrow’s love of common America led him to seek out stories of ordinary people. He presented their stories in such a way that they often became powerful commentaries on political or social issues. See It Nowconsistently broke new ground in the burgeoning field of television journalism. In 1953, Murrow made the decision to investigate the case of Milo Radulovich. Radulovich had been discharged from the Air Force on the grounds that his mother and sister were communist sympathizers. The program outlined the elements of the case, casting doubt on the Air Force’s decision, and within a short while, Milo Radulovich had been reinstated. This one edition of See It Now marked a change in the face of American journalism and a new age in American politics. Soon after the Milo Radulovich program aired, it was learned that Senator Joseph McCarthy was preparing an attack on Murrow. 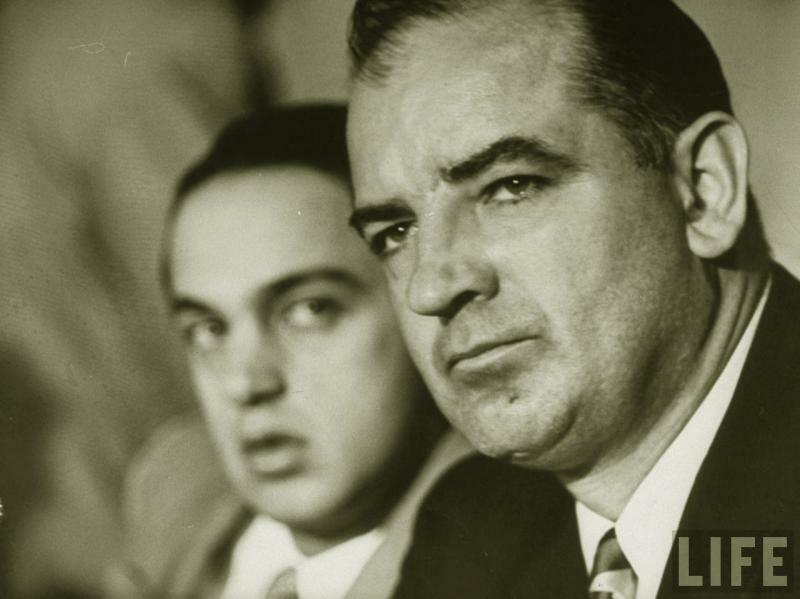 As it happened, Murrow himself had been collecting material about McCarthy and his Senate Investigating Committee for several years, and he began assembling the program. Broadcast on March 9, 1954, the program, composed almost entirely of McCarthy’s own words and pictures, was a damning portrait of a fanatic. McCarthy demanded a chance to respond, but his rebuttal, in which he referred to Murrow as “the leader of the jackal pack,” only sealed his fate. The combination of the program’s timing and its persuasive power broke the Senator’s hold over the nation. The entire fiasco, however, caused a rift with CBS, and they decided to discontinue See It Now. I would love to challenge one of today’s corporate mainstream media’s “journalists” to be as courageous. Unfortunately, it seems most of our mainstream journalists are bought and paid for, and will tell us ONLY what their corporate owners want us to see, hear, and feel. Research confirms that poverty is the real issue behind any academic achievement gap existing in the US and elsewhere. 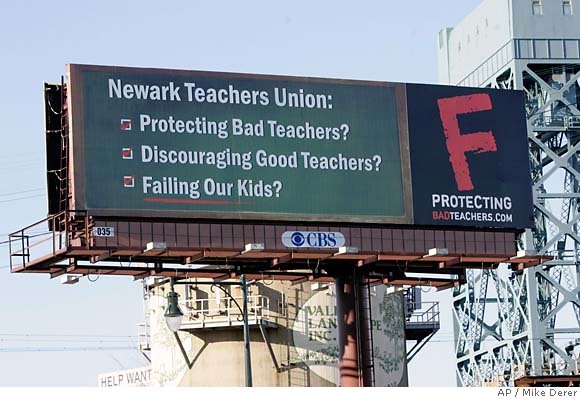 Instead of highlighting this fact, the mainstream media sweeps it under the rug and focuses instead on the constant demonizations of teachers and their unions. Remember, Bill and Melinda Gates’ message via their Gates Foundation tagline? It’s clear their proposition that “All Lives Have Equal Value” is pure propaganda, as Teri Yamada points out when she writes about their partners, Pearson Publishing in “Blood Money: Pearson’s Profit”. How is Bill Gates able to control the message delivered by the “mainstream media” in his attempt to destroy public education? Joanne Barkan is a REAL journalist, as was Edward R. Murrow. Will anyone in the mainstream media BECOME a real journalist? 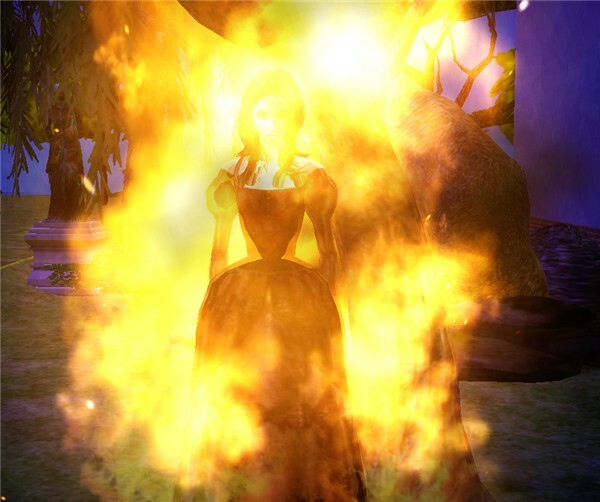 How will the Teacher Witch Hunts end? Is it up to teachers to gather together to create enough attention to attract the mainstream media? I still have hopes we could create enough attention to gather them to us and break the story wide open. I have hope we will be able to do just that, before it’s too late for children. “Senator McCarthy died yesterday in Washington,” wrote the English newspaper News Chronicle in May 1957. This entry was posted on Saturday, April 7th, 2012 at 10:19 pm	and posted in Barack Obama, Bill Gates, Carrots and Sticks, Corporate Education DeFormers, Incentives and Decentives, Mainstream Media, Measurement, Media, Melinda Gates, Oligarchy, Oppression, President Obama, Propaganda, Public School, Race to the Top, Racism, Standardized Testing, Teacher Evaluations, Teachers, Uncategorized, War on Public Education. You can follow any responses to this entry through the RSS 2.0 feed. We need more information like this. The job of teachers is not just equip learners in a standardized fashion to become worker-drones, and people who could never understand the true goals should not be given status and control. Thank you, Dan. I will continue to supply others with “more information like this.” I hope you will follow my blog and share it widely. Children are not widgets, like Bill Gates tries to produce, and not so well I might add. The miracles of edreform are beginning to show evidence of giant faults in their own system. 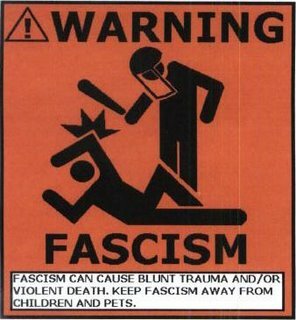 Expose them and we loosen their grips on control, we diminish their status. Great photo’s! I just hi-jacked a few. Please borrow all the photos you like, Dora! Share them widely! Thank you for your continued work in battling corporate education reform!